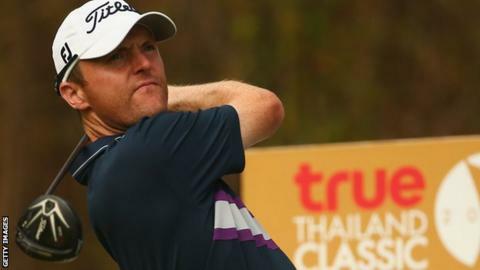 Overnight leader Michael Hoey has slipped to three shots behind new pacesetter Miguel Angel Jimenez at the inaugural True Thailand Classic. Northern Ireland's Hoey, who fired a course record 64 on the opening day, had a level-par 72 in the second round. Veteran Spaniard Jimenez carded a six-under-par 66 and leads by one from Thailand's Kiradech Aphibarnrat. Three players are tied for third, with Richard Lee, Scott Hend and home star Thongchai Jaidee on nine under. Hoey, celebrating his 36th birthday, had two birdies and two bogeys in Friday's round. His is tied for sixth place with England's Tom Lewis and Matthew Baldwin and Sweden's Johan Carlsson. "I threw away a few shots which was disappointing. I should really have got to 10 under at least," said Hoey. "It could have been worse and at least I am still in contention. "My game is good. I drove it in the water a few times by being slightly aggressive." Thailand's Panuphol Pittayarat missed the cut but goes home with a new luxury townhouse as the prize for his hole in one on the par-three 14th.